OK, some will say that this is not a “class” and that comparison is not fair, but one thing we have to admit, is more than fun. 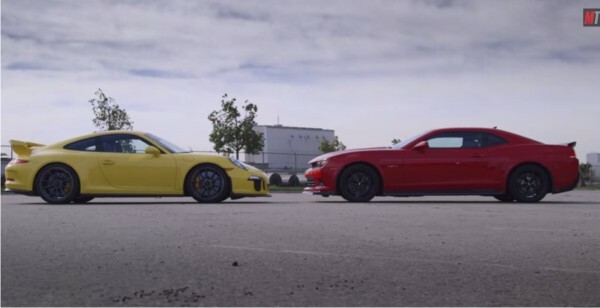 The Motor Trend “on the line” put the Camaro Z / 28 and Porsche 911 GT3. The first-mentioned has a 7.0 liter V8 with 512 hp and 479 lb-ft, which is over six-speed manual transmission transmitted to the rear wheels. Porsche drives 3.8-liter boxer with 480 “horses” and 440 Nm(325 lb-ft). Transmission is a seven-speed dual-socket. The biggest difference is in the weight and money. Camaro weighs 3880 pounds and cost $ 76,150, and the GT3 weighs 3262 pounds and costs $ 145,785. It is obvious that with the Camaro get more metal for less money. All kidding aside, and in both cases it is a racial-performance vehicle, so that they are directed by Motor Trend conducted on the street, race acceleration and more tests, before the big finale at Big Willow featuring Randy Pobst. Enjoy.